There’s a lot packed into this little painting. 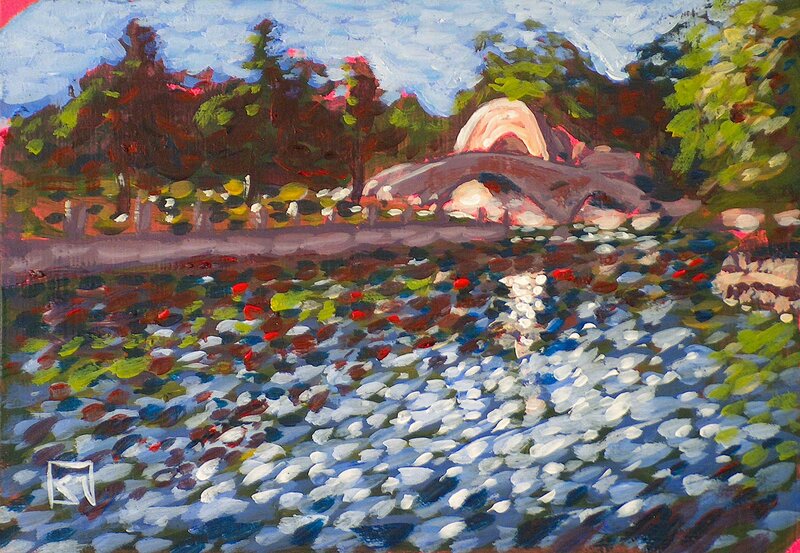 For starters, this was completed en plein air, out in the open, in other words. Also, this is an acrylic painting on a hardboard panel. The painting measures 5″x 7″. This scene depicts a city park that was famous in the early 20th Century, which indeed had a long gone Palace of sorts, housing minerals and gems from all over Colorado. The band shell, bridge and lake are all that remains of it glory days. Still a very nice park, and the Pueblo Art Guild, of which I am a member of, is just out of view to the left. This pointillist painting is being sold unframed.